As you probably know, I love both NBC’s Community and Parks and Recreation equally. Parks because it has so much positivity and charm, and Community for their band of outcast misfits, which any geek can identify with. So here is my most vanilla design ever, a basic amaray jewel case. I will probably do a fancy box set later (I have a few ideas already), but for now this basic design will fit the bill. This case design recreates the prominent locale used in Community, the study room in the library. Using a clear plastic case in tandem with a clear cell jacket liner, the windows of the study room are recreated. The cast image is then placed on either the disc (my preference) or the booklet or both. All of this serves to recreate the main set of the show to a degree. If you are familiar with the show, then you might appreciate this design, because it echoes the box-like study room where all the madness takes place. The room has two opposing walls comprised of windows and venetian blinds (and doors, but I omitted those!). This design also echoes one of my favorite package designs ever – Soundgarden’s Superunknown CD (1993). 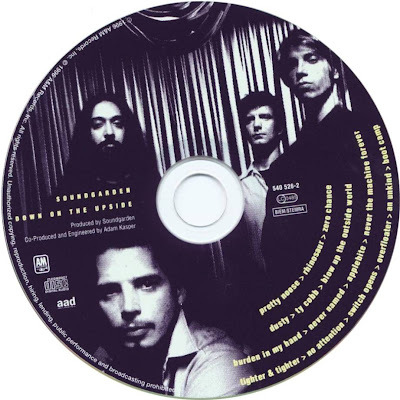 The disc art featured the band in front of a curtain, and when you removed the disc, the back flap of the case featured the same curtain – but no band. Essentially you were relocating the band to your CD player to perform, which is a witty design. Here the cast is also on the disc, in their study room habitat (the case), and you are doing the same thing essentially, but with your Blu-Ray player. Currently I didn’t use a booklet for this design, not really a fan of those (same with video game instructions). Though an inner liner could be used on the back flap to recreate the study room even further. Sadly Community has yet to debut on Blu-Ray. Season 1 is available on DVD, season 2 will be released in the next few months. EDIT: Oops I should have photoshopped Joel McHale into that cast picture. My bad. While it’s unfortunately missing Joel McHale, I really like this Blu-ray cover. Much better than the official DVD covers. Couldn’t find a decent cast photo inside the study room. :s Thanks!